Washington Monthly | What Do We Know About Obama-Trump Voters? What Do We Know About Obama-Trump Voters? 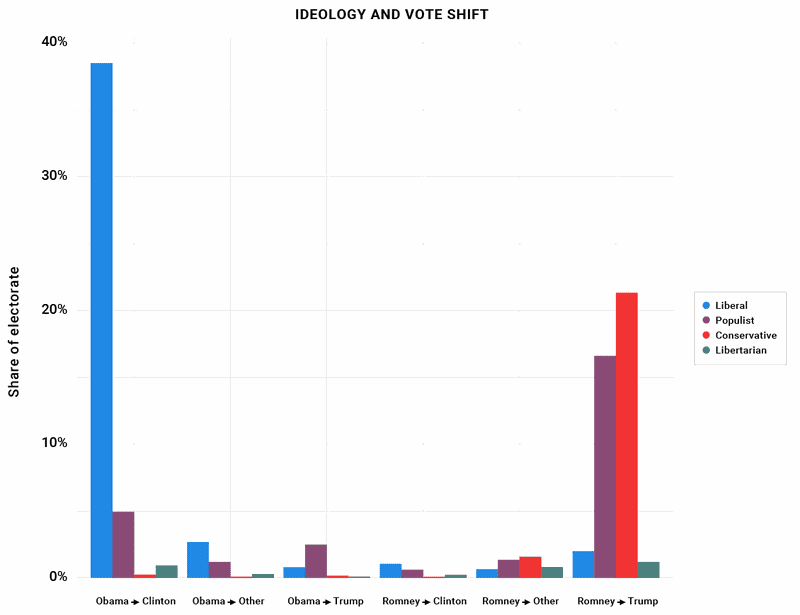 In the discussion about how Democrats can improve their electoral prospects in the future, a lot has been made of the Obama-Trump voters. They are defined by the fact that they voted for Obama in 2012 and then Trump in 2016. To be honest, I have to say that I’ve been pretty skeptical about what various people and groups have claimed about these voters. Making assumptions about them based on a comparison of precinct or county vote totals is interesting, but not terribly informative. What is important is any information we can obtain about individuals who actually voted for Obama and then Trump. I decided to review two studies that provide that for us. The first comes from Priorities USA. They surveyed 801 Obama-Trump voters in early February 2017. Their major finding was that 42 percent of respondents said that congressional Democrats’ economic policies will favor the wealthy, vs. only 21 percent who said the same about Trump. That is a stinging indictment of the Democratic message. What wasn’t reported as often is that an almost equal number of Obama-Trump voters (40 percent) said that congressional Republicans’ economic policies will favor the wealthy. While asking this question about Hillary Clinton’s policies wasn’t included in this survey, the overall findings are worth taking a look at. What jumps out at me is that the number of Obama-Trump supporters who think Democratic policies will help the poor is substantially higher than for Republicans or Trump. That raises questions that would be worth looking into—like whether or not this group of voters sees that as a positive or negative thing. The second group that collected information on Obama-Trump voters is the VOTER Survey. Here is how John Sides describes their methodology. In December 2016, the survey firm YouGov reinterviewed 8,000 respondents who had been interviewed originally in 2011 to 2012 as part of the Cooperative Campaign Analysis Project. In that survey, 45,000 respondents were first interviewed in December 2011 and were interviewed a second time in one of the 45 weekly surveys between January 1 and November 8, 2012. Finally, 35,408 respondents were interviewed a third time after the November election. Thus, for these 8,000 respondents, we have measures of their political attitudes in 2011 as well as self reports of their turnout and vote choice in November 2012. From that data they were able to quantify the Obama-Trump voters included in this overall breakdown. As you can see, 9.2 percent of those who voted for Obama in 2012 went on to vote for Trump in 2016. That is significantly larger than the 5.4 percent who voted for Romney and then Clinton. 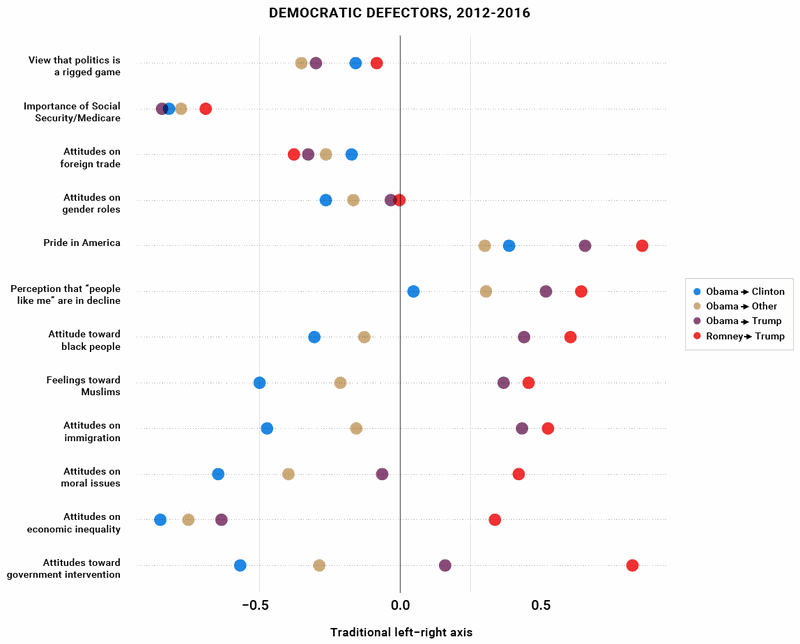 In analyzing this large set of longitudinal data, Sides zeros in on white voters and reaches this conclusion: “Attitudes related to immigration, religion, and race were more salient to voter decision-making in 2016 than in 2012. Other attitudes do not show this pattern.” The attitudes that were not as salient to voter decision-making in 2016 included items like economic issues, trade and entitlement programs. In other words, Obama-Trump voters were primarily “populists,” who are liberal on economic issues and conservative on identity issues. The dots you’ll want to follow for the Obama-Trump voters are purple. The division with Obama-Clinton voters (blue) is most stark in attitudes toward black people, feelings toward Muslims and attitudes on immigration – exactly the issues that Sides found most salient for voter decision-making in 2016 as opposed to 2012. Making economics more salient is one part of the equation. But to win back the working-class white voters, Democrats also have to find a way to make race and immigration less salient. Yes, that’s where things get tricky. So we’ll have to save that discussion for another day.